What is your commitment to the health and well-being of your team? As a leader, you have a responsibility to help those in your organization take care of their health and well-being. As an employer, there are many strategies available to help reduce stress, overwhelm and frustration in your employees. It doesn’t have to be a chore, rather fun and exciting for everyone to participate in doing. Consider challenging your team to sign up for charity events. 5K races, the Race for a Cure, or a charitable obstacle courses are a fun way to bond and get healthy together. If there isn’t something available, create one yourself. Challenge employees to lose weight, stop smoking, improve health and get moving. Have teams choose a charity of their choice to donate winning proceeds to. One of my clients, Johnson Kendall Johnson is always promoting health and wellbeing. Internally, they host FitBit competitions with prizes that encourage people to stay focused on their steps, calories burned, activity and movement. What’s an internal competition you could host that encourages your team to take care of themselves in a fun way? Consider hosting a wellness workshop. Ask your company’s insurance company to help host an event that promotes employees to check their blood pressure, pulse and body metrics. Search for other companies who focus on employee health and wellness. Many organizations would be delighted to provide lunch and teach your workplace concepts around stress management, meditation, breathing, healthy eating and prioritization. 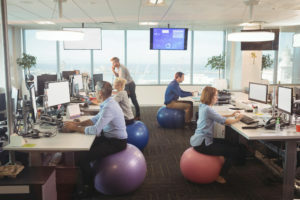 Research shows us when employers are paying attention to their employees’ health and wellbeing, those team members feel more aligned to your brand. They feel more loyal to your company. They know you’re taking care of them. What’s your commitment to your team’s health and well-being of your team? It doesn’t have to cost you anything, and yet that investment of your attention shows people they matter to you, because I believe that when you pay attention, attention pays. Want more ideas? Check out my video on YouTube and subscribe to my channel. Have we connected on social media? If not, let’s fix that. You can follow me on Twitter, or you can see my adventures on Instagram. Or, share articles with your team by downloading hundreds of articles for free at neen.greatideasfeed.com. Remember, when you pay attention, attention pays.